Belgium has a reputation for being a boring little country, but that is wrong. 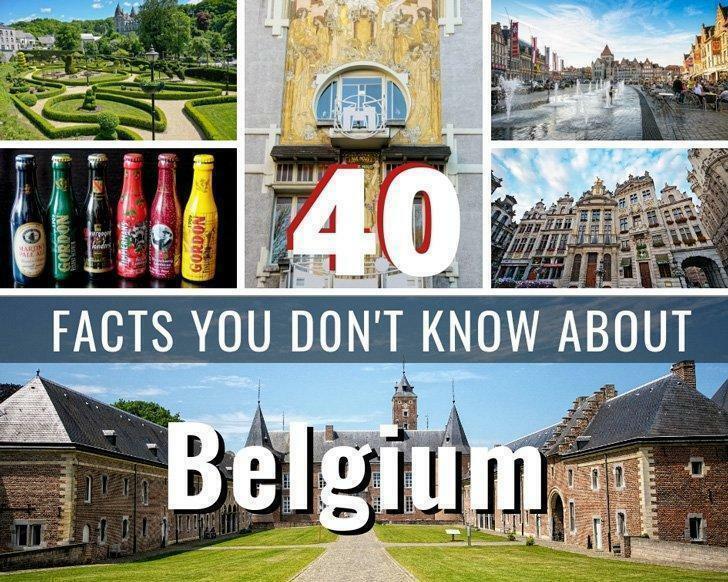 Here are 40 fun facts about Belgium you probably don’t know. Like most North Americans, I knew next to nothing about Belgium before I moved there. I knew they had great beer, the world’s best chocolate, and were home to the EU, but I certainly couldn’t name many famous Belgians or recite unusual Belgium history facts. To this day I am still learning interesting Belgium facts. One of the main reasons for this lack of image abroad is Belgians don’t like to toot their own horns. Since there is so much more to Belgium than beer and chocolate, I’ve decided I should do a little horn tooting for my adopted country. 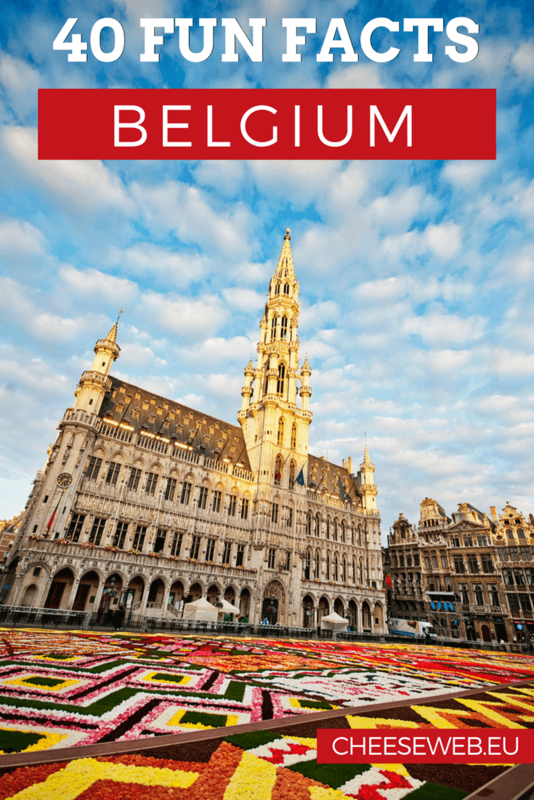 And if these fun facts inspire you to visit, be sure to check out our 10-day Belgium itinerary. 1. In 1066, Huy, Belgium became the first European city to receive a charter of rights, making it the oldest free city on the continent. 2. Brussels sprouts do come from Belgium and have grown in the Brussels area for over 400 years. 3. Although the exact number is a topic of hot debate, Belgium makes over 800 different beers. Belgians drink an average of 150 litres of beer per year per person. 4. Belgium produces 220,000 tons of chocolate per year. That’s about 22kg of chocolate for each person in Belgium. 5. Luckily, Belgians don’t eat all of that chocolate. The Brussels’ International Airport is the World’s largest chocolate sales point. 7. Belgians tend to be liberal thinkers. They legalised euthanasia in 2002, and gay marriage in 2003. 8. A 2007 European Report stated Belgium has the lowest salary gap between men and women in the EU after Malta. Belgium has the highest proportion of female ministers in the world (55% in 2000) and was one of the first to have a female parliamentarian, in 1921. 9. Belgium has compulsory education up to 18 years old. This is one of the highest in the world. 10. Belgium also has enforced compulsory voting. 11. Belgians pay some of the highest tax rates in the world, around 40% of their gross earnings. Taxation represents 45.6 % of the country’s GDP. An Organisation for Economic Cooperation and Development (OECD) study shows single Belgians paying 43% of their earnings in income tax and social security contributions. 12. Belgium grants the most new citizenships per capita in the world after Canada. 1.6 million people in Belgium are immigrants or children or grandchildren of immigrants. That’s 15% of the population. 13. Belgium has the highest density of roads and railroads in the world. It is the country with the 3rd most vehicles per square kilometre after the Netherlands and Japan. Because of all the lights, the Belgian highway system is the only human-made structure visible from space at night. 14. 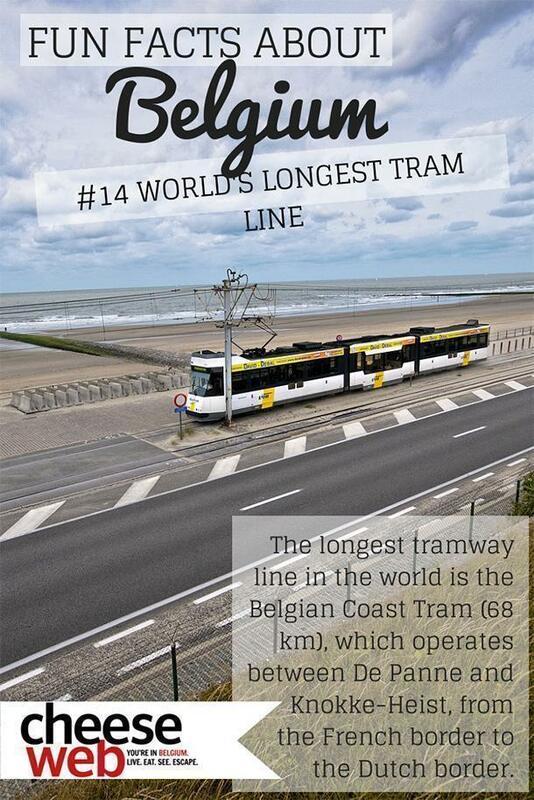 The longest tramway line in the world is the Belgian coast tram (68 km), which operates between De Panne and Knokke-Heist, from the French border to the Dutch border. 15. 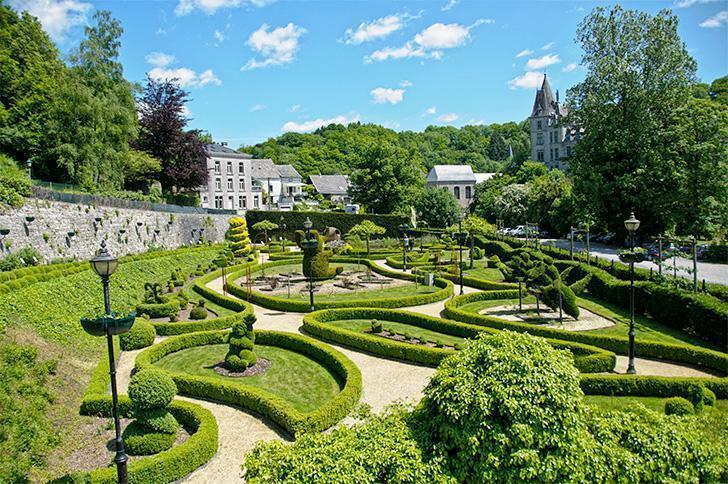 Spa, Belgium is home to Europe’s first modern health resort, opened in the 18th century and Europe’s first casino, la Redoute, opened in 1763. 16. 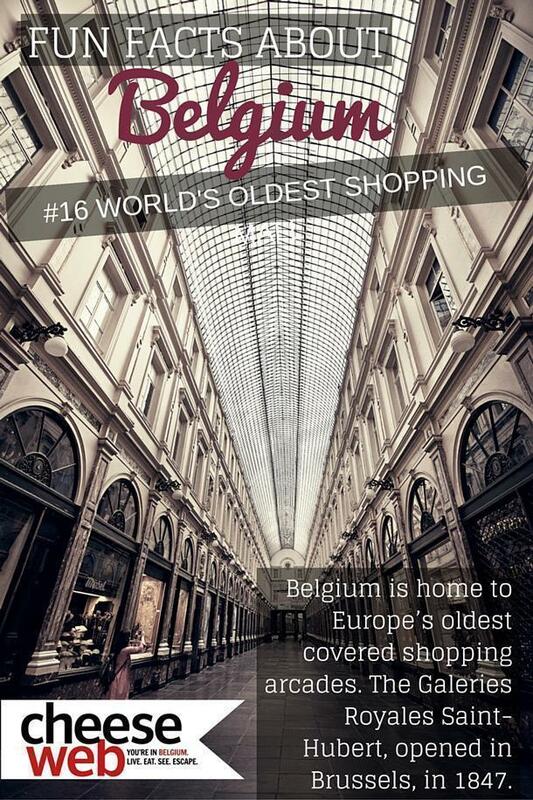 Belgium is also home to Europe’s oldest shopping arcades, the Galleries St Hubert in Brussels, opened in 1847. 17. Belgium was the scene of Napoleon’s final defeat, at Waterloo, south of Brussels. 18. The Law Courts of Brussels is the largest court of justice in the world (26,000 m² at ground level). It is bigger than Saint Peter’s Basilica in Rome. 19. Nemo33, in Brussels, is the world’s deepest swimming pool, reaching 35 metres in depth. It is a practice ground for scuba divers. 20. Most people have heard of the comic strip Tintin, but did you know that in 70 years of existence, 200 million books of “The Adventures of Tintin” have been sold worldwide. Belgium also has more comic makers per square km than any other country in the world, even Japan. The Smurfs and the Snorks are also Belgian creations. 21. The saxophone was invented in Belgium, in the early 1840’s by Adolphe Sax (1814-1894), in the city of Dinant. 22. The Body Mass Index (BMI) was developed by the Belgian, Adolphe Quetelet, and is still used today to determine a person’s ideal weight. 23. In the 15th century, Belgians were credited with inventing oil painting. 24. 80% of billiard players use Belgian-made balls. 25. Brussels was a famous hideout for Europeans in Exile. Karl Marx wrote the Communist Manifesto with Friedrich Engles between 1845 and 1848. Victor Hugo was also exiled here and completed Les Misérables while visiting Waterloo in 1861. 27. Belgium has the densest rail network in the world with 4078 km of track. 29. You may think of Holland when you think of tulips, but the bulbs arrived in Antwerp first, in 1562. 30. The world’s first recorded lottery took place in Belgium, to raise money for the needy. 31. Brussels has 138 restaurants per square mile. Find the best ones here. 32. The only Belgian race car, the Vertigo, holds the Guinness World Record for fastest acceleration from 0-100km/h in 3.266 seconds. 33. In 2006, the Association of European Airports reported Brussels International Airport was the most punctual of the 27 largest airports on the continent. 34. A drive through the suburbs will substantiate, Belgium produces the widest variety of bricks in the world. 35. Besix, a Belgian construction company, was one of four contracted to construct the world’s tallest building, the Burj Dubai. 36. The world’s biggest baby, weighing 5.4kg and measuring 57cm long, was born in Knokke in December of 2006. 37. Belgium was the first country to issue electronic passports, meeting ICAO standards, and along with Italy, was the first to issue electronic ID cards in March 2003. 38. The smallest town in the world is Durbuy, Belgium, with less than 500 inhabitants. 39. Belgians proposed both the name of the euro currency and the design of the € symbol. 40. Although it is now based in Paris, Club Med was started in 1950 by Belgian Gérard Blitz. 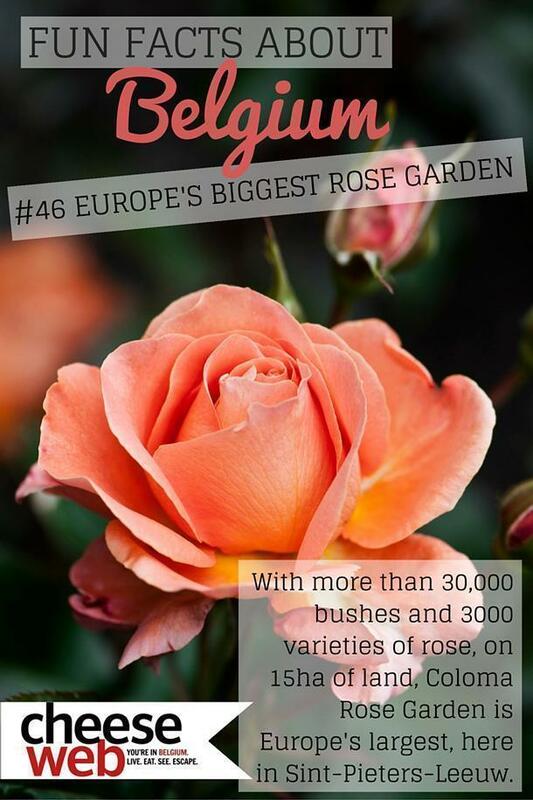 Bonus: With more than 30,000 bushes and 3000 varieties of rose on 15ha of land, Coloma Rose Garden is Europe’s largest, located in Sint-Pieters-Leeuw, Belgium. Now that you know more Belgian facts, why not test your knowledge by taking our quiz!